Thanks for this. These are always helpful references when I'm trying to get someone new to read the series. Good work Wert, but SW has to be read before OST because of the Kiska arc. Thank you for this reading list, this is what I am going to go with.I Just finished GotM and found it extremely rewarding. it was difficult to adjust to SE's writing style and content straight after my ASoIaF read. I am now 90 pages into DG. i was using the Tor reread to get me through the initial challenge of the first half of GotM and found it helpful but felt that their reading order was wrong, going on to Knives after GotM. I am up and running with the series now and dont require any hand holding and you put forward a persuasive case for this order so Im going to go with this. After finishing GotM I have been looking into different reading orders and weighing them up and then this post came up. chance?..luck?..or is it Oponn..am i having a convergence??? am i in danger? Hood's breath! So IMO RotCG should be after RG. I agree with much of this. I'm a strong advocate of not splitting DoD and tCG, and I agree the best place for B&B is post-CG. SW must be read before OST due the Kiska arc mentioned above, but I'd reverse the order of RG and RotCG. 1. Ng gur raq bs EbgPT, Fxvaare orpbzrf gur Xvat va Punvaf, fcbvyvat gur snpg gung Euhynq vf qrnq. 2. Ng gur raq bs ET, jr ner fhecevfrq gb yrnea gung Gbp gur Ryqre vf fgvyy nyvir. Guvf fubhyq gura yrnq gb frrvat uvz nyvir va EbgPT nsgrejneqf (naq fvapr ur gura qvrf, ernqvat ET nsgre EbgPT jbhyq or bhg-bs-frdhrapr). 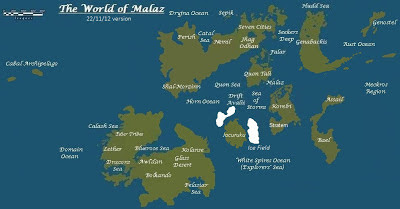 I've been thinking about reading Malazan for years, but have never quite gotten up the courage. It seems to be rather polarizing and what I've read about the series as a whole sounds intimidating. Am I missing out? Should I just go for it? Many many thanks for this, Adam, very much appreciated! I've yet to read these books and have asked myself which would be the best way to read them. I already was very thrilled to see the first reading order on your blog a while back and was hoping for an update for the new books later on. Thanks a lot for your post which encouraged me to tackle the series in 2013. Thank you for this! I have been planning to read this series for years, and this helps with planning which books to get when. I am really trying to finally read it this year. Personally, I should forget the ones written by ICE. If Night of Knives had been the first book I'd read I should have not bothered with the rest. I found it so poorly written that I only read half of it before moving on to the Bonehunters to get back to the excellent writing of Steven Erikson. It is my personal opinion that ICE has no writing talent. When will you post the updated map on the malazan wiki site? This isn't an official map or based on one, so should not be used on a wiki. Thanks for this i'm buying the books in order following this list. At reapers gale now. Personally I'd read the Erikson in publication order first and then the Esslemont. I do not understand why you say that Orb Sceptre Throne reduces the amount of time between Memories of Ice and Toll the Hounds. You state that existence of a five-year-old Harllo in TtH must be ignored, and that OST retcons the time elapsed to two years. How, then, to explain that Harllo appears in OST and is described on page 362 as "coming into adolescence". That should make him around ten years old, not two years old! I think that your chronology is good, but that the certainty in dating is less so. Both authors have now used the same child to place a considerable amount of time in between MoI and the events of the later books. I am not sure I can face reading any more ICE books. RotCG was such a slog, I am just coming to the end of Toll the Hounds and two more books is about as much as I can take. TtH is a very long book, too long in my opinion. I don't think I will bother with these mammoth series anymore. I bailed out of the Wheel of Time at about book 8, far too much padding! I am working my way through the series again and am a huge fan. It is is frustrating though. There are a lot of conflicting statements and scenarios given. Not only between authors, but by Erikson himself. Side note: Night of Knives has to take place before the prologue of Gardens. Thanks for the list. I'm going to continue with your recommended order. Thank you for this list. I've just finished the 10th book in the Book of the Fallen series and feel like I missed so much. This gives me a framework for filling in the blanks as I reread the series.